Winter has hit full force here in Oklahoma with the temps dipping into single digits this morning. Brrr. For some reason cold weather doesn’t negatively affect my running as much as hot weather does. I ran a fun but frigid 5 miles last night. I find that I actually have faster and better quality runs when the weather is really cold. That’s not to say that I don’t reeeeeally love a hot shower and coffee afterwards though. J Last week my mileage was around 20 miles so I’m easing back up there. My injuries seem to be subsiding and I’m getting back to having some pain free runs again. Yippee! A little bit of top-of-foot pain and arch pain still but not so bad that I can’t run on it. I ice my foot after a run and baby it a little with Arnica rubs and taping the arch. No long run last weekend…I volunteered at a 25K trail race and got to do lots of visiting with other runners and made a couple of new friends. 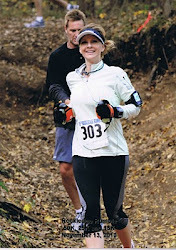 Bandera was last weekend and I’m loving reading all the race reports! Liza Howard from San Antonio won the 100k womens race and I’m in awe of her time of 9:33. She broke the course record by an hour! Amazing. HERE is her race report. Gotta go, we are headed out to see “Hood to Coast” and hopefully it will be as entertaining and motivating as all the hype says it is! I tend to run a little bit faster when it is freezing too!!! Just want to get it done and get warm again! Hood to Coast was really good! There was this one team called Thunder and Laikaning that cracked me UP! I'd heard of Hood to Coast before but really didn't know what it was. It followed four teams throughout the entire race. Race Across the Sky made Leadville a household name and increased registration by a lot so I am sure you are right and Hood to Coast will be reeeeeally hard to get into now!